Have you ever traveled and had a hectic experience due to lack of clean toilets? Or instead had access to one, but couldn’t use it due to its unhygienic state? Sometimes even needed to supply a urine sample to your doctor but lacked a proper way to collect it? Apparently, every woman has been there, at some point, in a long drive or airplane. Whether traveling for seminars, conferences or just for recreation purposes. Well, the good news is, p-mate is here to take away all these challenges. Precisely, it’s a convenient item that allows women to travel with no worries, enabling them to urinate while standing and in the most comfortable and hygienic way possible. When it comes to women, cleanliness it’s everything. And fortunately with our product, this is guaranteed. P-mate has a wide opening. Therefore, will ensure that there’s no splashing that can stain your clothes. In fact, all a user is supposed to do is open the device, lower their pants or push their skirts and underwear a bit, place the p-mate in position ensuring it slightly touching their skin, then let nature take its course. Quite reliable, this product is a must have for those got to go moments. Unlike other FUK’s (Female Urination Kits), P-Mate fits against the skin. 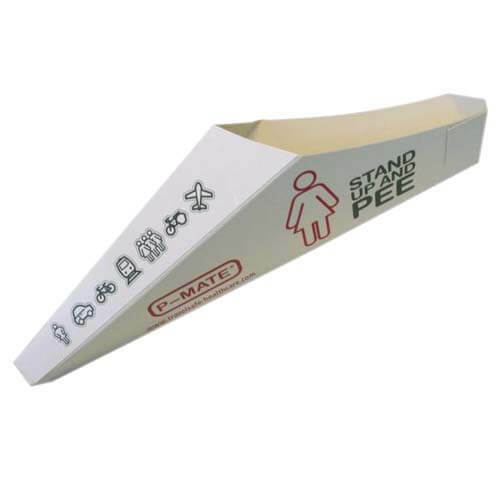 From its container-like shape, it ensures that the urine doesn’t flush backward. It’s large opening allows for optimum cleanliness when using. As a matter of fact, it is quite comfortable when in use. So if you were planning to go on a long journey but wondered what you would use on your way, then worry no more. Because of the p-mate, urination while standing is possible; order your package today for your convenience while traveling. As with everything, environmental friendliness is vital. Fortunately, our p-mate device is made from sturdy cartons which are not only recyclable but also fully eco-friendly. Extremely hygienic, it’s made from 100% recyclable materials, and hence disposable. Ideal, right? Well, all you have to do is place your order and the p-mate will do the rest. The ergonomic nature of the p-mate is based on several customers’ experience. As a result, it’s perhaps among the most convenient accessories you can ever think of. Acquire your package today, and we can guarantee an exceptional experience. With as little as $5.95 for five, you will be able to obtain your personal set. Therefore, if you are planning to go for an event and want something to make your travel more comfortable, then the p-mate is probably what you require. Order now while on sale. You’ll have a great experience outdoors using it. What a great idea. Wish I would have thought of this. These are great for every day use. I keep them in all of my purses so I have one with with me at all times. Finally, I can do it just like my boy friend. We go camping all the time and now I don’t have to worry about hiking in to the woods so far.